2. Cut off a few rosebuds from the stems of the plants. 3. Flip the flower over and trim the stem as short as you can without cutting the base of the flower. 4. Grab hairpins or also known as U-pins, these are different from bobby pins. These do not bend in the same way, so have less of a risk of breaking or damaging the flower heads. 5. Lightly squeeze the hairpin and pierce it through the middle of the spray rose downwards do the open end of the flowers go all the way through the flower and out the bottom. 6. Fold the hairpin back on both sides (see photo 7). 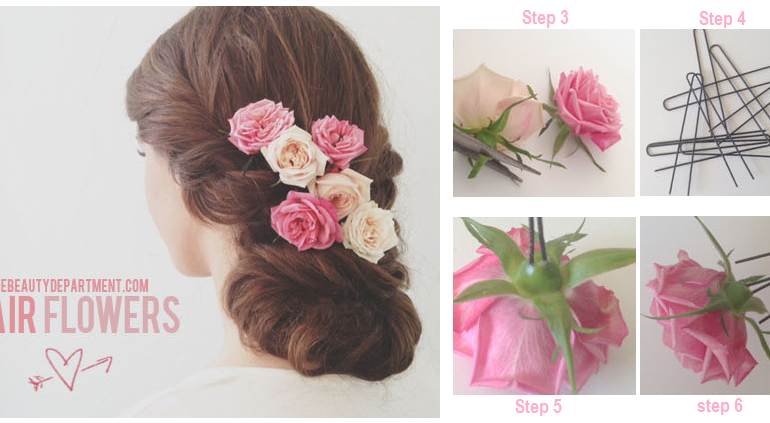 This will keep the flowers from slipping out of your hair!